In a surprising finding, patients who live with the painful disorder fibromyalgia have reported that commonly prescribed drugs for this condition actually make their symptoms worse. This is according to a new study by CureTogether, a free resource owned by 23andMe that allows people to share information about their health and treatments. People in the study said they found that lifestyle changes like rest, heat, and various ways of reducing stress offered the most effective relief. In addition many of those surveyed said that the drug Naltrexone at a low dose worked well. 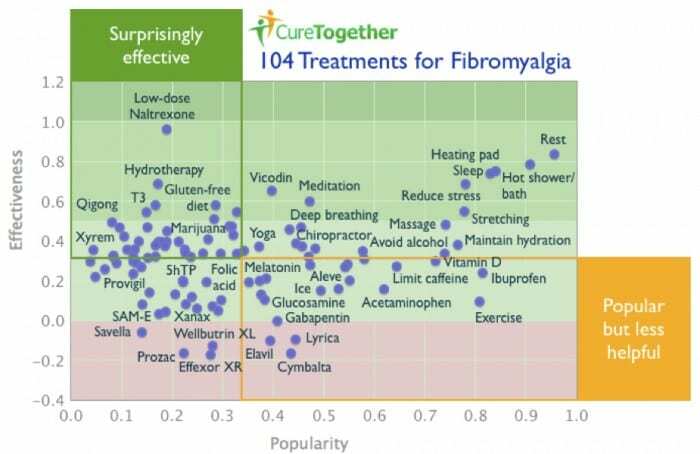 Conversely, well-known fibromyalgia drugs such as Lyrica, Savella, Cymbalta, and Effexor, were reported to worsen rather than improve patients’ symptoms, according to the study. Fibromyalgia affects at least 5 million Americans, according to the Centers for Disease Control. The disorder is characterized by musculoskeletal pain, and other symptoms including fatigue, disrupted sleep, as well as depression. Researchers believe that fibromyalgia amplifies painful sensations by affecting the way a patient’s brain processes pain signals. The condition is poorly understood,, so finding accurate recommendations on treatments can be challenging. In the CureTogether study, researchers asked 1,401 people suffering from fibromyalgia to rate the effectiveness of 104 different treatments. Participants shared information about their symptoms as well as what treatments worked best for them. We’d like to thank those who participated. And just as they shared their experience with treatments, we’re freely and openly sharing the results of the Fibromyalgia study. Please tweet, blog, or pass this along to anyone who can benefit or is interested in Fibromyalgia. Thank you!